The world of mobile app analytics tools is changing fast, and we’re far ahead of where we were even a few years ago, when your only choice for tracking your app was repurposing one of the major web analytics products. These days it seems like there are too many choices. App analytics is a hot market with lots of smaller players chasing your business. That means each app analytics tool vendor tries to sell you what’s special and unique about their product — while at the same time telling you they can do it all. So how do you choose the best app analytics tools for your app? As it is, you’ll probably want to use different vendors for measuring different activities. There’s often crossover between products’ features, but some app analytics tools are better at measuring the acquisition cycle, others are better at tracking usage, some will help you with testing, and still others are designed to monitor your app’s performance. You may well end up using tools from multiple providers. The key is not to let the tool drive your strategy. The most important thing is setting clear, measurable objectives up front that help you gain insight into how people discover and use your app. It doesn’t really matter which tool collects that data as long as it is accurate, reliable, and timely. We’ve grouped the following analytics tools according to their focus. This isn’t an exhaustive list, and each app is different. Your mileage with each may vary. Most vendors offer some sort of trial period, so it’s worth spending some time with each product to find out if it’s right for your app. These tools help you in the growth stage of your app lifecycle. They’re best at tracking where your users come from and guiding you in finding the right market fit for your app. App Annie pulls data from the App Store and Google Play and can also connect to your app’s Google Analytics data to pull usage information. It can track downloads, in-app revenue, and ad spend. App Annie also gathers data about other apps from the various stores, so it’s really good if you have a portfolio of apps that you need data about collectively. On the other hand, you’re not going to get much from App Annie in terms of in-app objectives and hypothesis testing. This is definitely a product that would complement your in-app analytics, not replace them. Tune is a one-stop shop for app marketers. Like App Annie, it’s best for tracking the early stages of your users’ interactions with your app, particularly discovery and installs. It can help you manage in-app campaigns, get data about your app store performance and dig down into what is driving your users to become customers. Tune is also useful in managing your users’ initial experience with the app and increasing the quality of your app traffic. Localytics seems to sit halfway between App Annie, Tune, and the more analytics-only products listed below. The company bills itself as a “mobile engagement platform,” which means that it uses the data it collects to power marketing automation features. So, you can use the same tool to track your key metrics as you can to send push notifications, or create audiences to remarket to users on external ad or social networks. With built-in cohort segmentation and lifetime value analysis, Localytics is a good option if you’re looking for a one-stop shop. Mobile app analytics tools are a natural progression from web analytics. In fact, many app producers still use the same tools for collecting data from their apps that they were using on the web back in the mid-2000s. While web packages like Google Analytics or Adobe SiteCatalyst don’t translate directly to mobile, these products have provided our industry some insights, and in the case of Google Analytics, have adapted to address the changing mobile ecosystem. Google Analytics (GA) is the granddaddy of digital analytics. It’s been free for the majority of users for its whole life, has a well-understood and simple data collection framework, and you can dive right in without much training and start deriving insights immediately. That said, it was built for e-commerce on the desktop and that is where its strengths lie. Its mobile web and app analytics tools seem to be almost bolted on to the core product and, while you can still track your apps very successfully with GA, it doesn’t have some of the bells and whistles that some of the other products do. If you have a multiplatform product where your app is just part of a desktop and mobile web experience you can be very well served by GA. But if your product is mobile app only — and you can afford it — it may be worth looking elsewhere or using Firebase, Google’s mobile-focused product, described below. Although Mixpanel has a strong focus on mobile apps now, it came from the same world GA did. Starting out on the desktop as a tool to measure engagement and retention, the product has improved so it’s now an all-arounder of the analytics world. Mixpanel prides itself on simple implementation and taking the hard work out of analytics — holding your hand to help you measure user actions rather than vanity metrics such as page views. With funnel visualizations and A/B testing, Mixpanel is a great option for a multiplatform product for teams that don’t have much experience with analytics. Flurry (now part of Yahoo) has long been the market leader for mobile app analytics. One reason may be that, like Google Analytics, it’s free, but unlike GA it’s designed purely for mobile apps so it doesn’t have the legacy web and desktop limitations. Implementation is simple, and so is the interface. But don’t expect the bells, whistles and push notification management you may get from other products. That said, there is everything you need to track and measure your key app metrics on a basic level. While some of the products listed in here so far are more focused, the following two cast their nets over many aspects of app development and measurement. These mobile development platforms include hosting, authentication, messaging, performance, optimization, and analytics. If you’re already using these platforms for development of your app, there’s probably no reason to use another product simply for analytics. If you’re not, you can use the analytics modules separately, but it may be overkill. Firebase, by Google, was originally a backend-as-a-service (BaaS) with a central, shared database that apps could use to update and share data. This meant short development times for app developers and the ability to push updates without investing in their own infrastructure. Now, Google hopes the platform will become the only thing you ever need for app development — including analytics. Google sees Firebase Analytics for mobile apps as a replacement for Google Analytics and recommends using Firebase instead of GA if your product is only a mobile app. Like Localytics, Firebase uses the data it collects to power its other features, such as user notifications. Fabric is Twitter’s version of Firebase. It’s based on a popular app performance product called Crashlytics, and, like Firebase, it now includes everything you may need to develop, optimize and monetize your app. It also includes an analytics module called Answers that can be used as a standalone product. Twitter suggests that Answers will surface insights without any real analysis on users’ part. That’s fine if you only want to pay lip service to your analytics, but if you’ve placed analytics and measurement strategy at the heart of your app development process, it may not quite meet your needs. While most mobile app analytics tools include some form of testing and optimization functionality, depending on your team’s skills and needs, it may be worthwhile to use a pure testing tool. A great benefit of these tools is that you can use them to change your app’s features and elements on the fly when you decide on a winner. That means no waiting for app store approvals to push your optimized app live. Optimizely is the go-to product for A/B testing on the web — and now for mobile apps too. It’s been used widely over the years, has a simple interface for creating tests, and is easy to get going. There has been some discussion in the data science community about the statistical significance of some of its results (which the company stands by), but as part of a well-designed analytics strategy, it’s a great tool. It remains to be seen if the more general analytics tools that offer testing will make Optimizely redundant. Offering similar functionality to Optimizely, Apptimize is a relative newcomer to the space. One advantage it has over similar products is the ability to set feature flags that allow you to roll out app features to select audiences, so you can soft launch a feature to a small group of users to gather data quickly before rolling it out to your entire user base, or roll it back if your hypothesis is proven incorrect. New Relic is a bit of an outlier in this list because it is primarily an application performance monitoring tool that has grown and expanded to include analytics. If you have a heavily trafficked app where performance is key, you can’t go wrong with New Relic as your monitoring tool. And if you already have New Relic installed, it’s probably not much of a leap to use its analytics product, too. However, New Relic Insights reflects its provenance as an outgrowth of monitoring and performance, so you may be better served with an analytics tool built for mobile apps. There is always the option of building your own tools to gather and analyze your data. Between log files, simple event collection, and the availability of cloud storage, if you have the expertise in-house and a strong focus on your analytics needs, it may be worthwhile to push your data into a NoSQL database and employ visualization or business intelligence tools on top of that. The big benefit here is that you own your data, and you don’t lose it if your contractual agreements with vendors change. Despite what the marketing materials about any app analytics tool will tell you, you will still have to do some work to make sure that your implementation meets your specific needs. All apps are different, and no analytics tool will give you all the insights you need out of the box. Use your measurement plan to track audiences and user interactions that are important to your objectives. Design your analytics data collection with precision. Don’t just throw events on every button, link, and form without some understanding of the relationships between your user flows, funnels, and interactions. Create structured relationships between events that are meaningful and organized. Use hierarchies of events to tighten your organization. Make sure every step in your app is unique so you know what you’re measuring. Put some thought into how best the analytics tool can work for you — not for the vendor or every other customer they have. 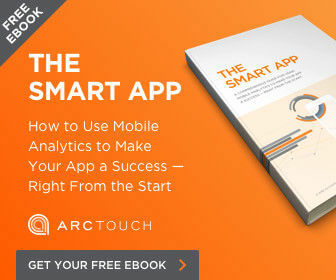 Find out more about top mobile app analytics tools in our new ebook, The Smart App: A Comprehensive Guide for Using Mobile Analytics to Make Your App a Success — Right from the Start. Martin Bell - Martin Bell is a mobile analytics specialist for ArcTouch. Build or buy? What kind of workplace app offers the best ROI?